The current Ewald Chevrolet Buick *EVERYONE QUALIFIES* price is $50,760. You may also qualify for additional incentives like military rebate or recent college graduate. WE'LL MEET OR BEAT ANY ADVERTISED OFFER ON ANY NEW VEHICLE WE SELL OR WE WILL GIVE YOU $500. We'll pay more for your trade! Ewald Automotive, we're minutes from anywhere. This 2018 Chevrolet Silverado 3500HD Work Truck features a Summit White exterior with a Jet Black interior. Factory equipped with an impressive 6.6 liter turbo, and an automatic with four wheel drive. DESIRABLE FEATURES: 4WD, Diesel, and Bluetooth. Your 2018 Chevrolet Silverado 3500HD Work Truck is one of 13 other trucks like this in stock Watertown drivers will find available to test drive at our new truck showroom in Oconomowoc, WI. This Chevrolet Silverado 3500HD is perfect for any ones truck needs in our neighboring communities of Waukesha, Hartland, Milwaukee, Oconomowoc, Rubicon, Brookfield & Watertown, Wisconsin. TECHNOLOGY FEATURES: This Chevrolet Silverado 3500HD for sale near Waukesha includes a Electronic Messaging Assistance, an AM/FM Stereo, and an MP3 Compatible Radio. Stock # 18C778 is priced below retail market value! Ewald Chevrolet Buick New Chevy Light Duty, Heavy Duty and Commercial Truck Super center has this 2018 Chevrolet Silverado 3500HD Work Truck competitively priced for a fast sale today. With Ewald Chevrolet Buick exclusive MAX Allowance® vehicle purchase or trade in program you can use your smartphone to get a Considerate Cash Offer™ and receive a check for your current vehicle today. Ewald Chevrolet Buick always pays trade in prospects and for sale by owner vehicle sellers in Southern Wisconsin MAX Allowance® for their private seller vehicles. Even if you don’t plan to purchase this 2018 Chevrolet Silverado 3500HD Work Truck from us; we want to buy your vehicle for MAX Allowance®. Our Chevy Dealership: Call Ewald Chevrolet Buick today at (262) 226-2842 to schedule your test drive of this 2018 Chevrolet Silverado 3500HD Work Truck! Ewald Chevrolet Buick features a wide selection of new Chevy trucks for sale near Waukesha, Hartland, Milwaukee, Oconomowoc, Rubicon, Brookfield & Watertown, WI. You can also visit us at, 36833 E Wisconsin Ave Oconomowoc WI, 53066 to check it out in person! That’s why we offer the MAX Allowance® smartphone communications system where you can share photos, video and vehicle history details with our Seller’s Agents. Ewald Chevrolet Buick will assign you a MAX Allowance® used vehicle Seller’s Agent who will work with you to review your vehicle’s unique value to our Used Car, Truck & Van Buying Division. 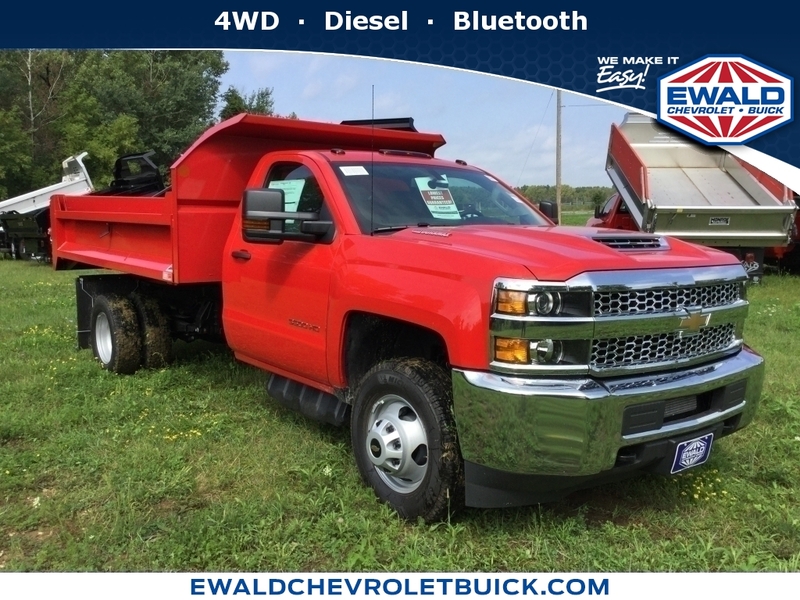 Say goodbye to disappointment around the trade in part of your deal when buying this Chevrolet Silverado 3500HD from Ewald Chevrolet Buick in Oconomowoc, WI. Ewald Chevrolet Buick New Chevy Light Duty, Heavy Duty and Commercial Truck dealership in Southeast Wisconsin is an easy drive or fly in from anywhere in the United States. Our Chevy dealership sits just east of Watertown, WI. When choosing Chevy dealers Milwaukee, Wisconsin shoppers prefer the short drive to Oconomowoc where Ewald Chevy has a new Chevy Superstore and has the best customer service. We’re glad you found this new Chevrolet Silverado 3500HD for sale at our Chevy dealership near you in Waukesha, WI in Oconomowoc, WI. Looking for Chevy financing? Our Ewald Chevrolet Buick finance specialist will find the best rates available for this new Chevrolet Silverado 3500HD for sale. Ewald Chevrolet Buick has new cars for sale and used cars for sale in Oconomowoc just west of Milwaukee, Wisconsin. Ewald Chevrolet Buick New Chevy Light Duty, Heavy Duty and Commercial Truck Super center sits just west of Milwaukee. We stock and special order the new Chevy Silverado 1500 pickup trucks, diesel trucks and commercial trucks Waukesha, Hartland, Milwaukee, Oconomowoc, Rubicon, Brookfield & Watertown, WI pickup truck shoppers prefer, like this 2018 Chevrolet Silverado 3500HD Work Truck Stock# 18C778. DISCLAIMER: Ewald reserves the right to verify a competitor's offer. Not valid on prior sales. Competing offer in writing must be from a new car dealer from the same manufacturer in the Midwest region. Customers must provide a written offer from a competitor and the vehicle must be the same MSRP price, color and equipment match of guarantee to be valid. Guarantees applies to new and untitled vehicles. Demonstrators, test drive units, dealer rental or service vehicles are not valid for comparison. Manufacturer incentives (must be identical) including finance or lease offers and are subject to consumer eligibility. Dealer reserves right to factory order a like vehicle to honor prices guarantee. Limited production vehicles are excluded. See dealer for details. Policy effective 4/1/2013 and is subject to change and review by Ewald Automotive Group. Engine: Engine, 6.0l V8 Sfi Gaseous Cng/lpg Capable / With Hardened Valves And Valve Seats. Capable Of Operating On Both Gasoline And Cng/lpg. E85 Compatible Prior To Gaseous Fuel Conversion. Running On Gasoline (360 Hp [268.4 Kw] @ 5400 Rpm, 380 Lb-ft Of Torque [515.0 N-m] @ 4200 Rpm). Equipped With Standard Factory Gasoline Fuel System. Does Not Include Gaseous Fuel Tank(s), Lines, Regulators, Etc. Gaseous Fuel System Can Be Installed In By Aftermarket Upfitter. Gm Recommends Use Of Our Approved Alternative Fuel Upfitter, Psi (power Solutions International). Ship Thru Codes Are Available For The Psi Cng And Lpg Fuel Systems. Emissions Certified For Gasoline Usage Only. Emissions Certification (exhaust And Evaporative), As Well As Safety And Labeling Standards For The Cng/lpg System Is The Responsibility Of The Gaseous Fuel System Manufacturer. Additional Equipment: Wt Convenience Package / Includes (dpn) Outside Heated Power-adjustable Vertical Camper Mirrors, (dd8) Inside Rearview Auto-dimming Mirror And (aqq) Remote Keyless Entry; Regular Cab Also Includes (a31) Power Windows. Additional Equipment: Siriusxm Satellite Radio / Is Standard On Nearly All 2018 Gm Models. Enjoy A 3-month All Access Trial Subscription With Over 150 Channels Including Commercial-free Music, Plus Sports, News And Entertainment. Plus Listening On The App And Online Is Included, So You'll Hear The Best Siriusxm Has To Offer, Anywhere Life Takes You. Welcome To The World Of Siriusxm. Additional Equipment: Onstar Additional 30 Months Of Onstar Fleet Guidance Trial Service. / Provides 30 Months Of Guidance Service In Addition To The 6 Months Of Standard Guidance Plan Trial Service (12 Months For Cadillac) That Is Included In The Price Of The Vehicle (plan Excludes Hands-free Calling Minutes). Total Service Duration Is 36 Months (42 Months For Cadillac). Additional Equipment: Speedometer Calibration / Provides An Owners Manual Supplement Listing Of Speedometer Calibrations To Be Programmed Into The Powertrain Control Module (pcm), After Sale, To Accommodate Tire Size Changes Utilized By Railroad Equipment. Additional Equipment: Increased Front Gawr / Provides A Higher Fgawr For Hyrail And Bucket Truck Applications. Provides A 4800 Lb. Gawr On C36003 And A 5200 Lb. Gawr On K36003 Or C36043 And 5600 Lb. Gawr On C/k36403 And K36043. Note: No More Than 1100 Lb Of Weight Added Forward Of Front Axle Centerline And Center Of Gravity Weight Added Forward Of Front Tires Not To Exceed 61" In Length From Center Of Front Tire Contact Patch. Additional Equipment: Rear Camera Calibrations Without Guidelines / A Calibration Without Guidelines Will Be Flashed At The Plant. Vehicle Will Not Have A Rear Camera. Camera Will Be Added By The Upfitter. Additional Equipment: Seats, Driver And Passenger Front, Individual Seats In Base Vinyl Trim / Derived From A Rpo (ae7) 40-20-40 Split Bench Seat With The 20% Section Removed. Seats Are Manual, Not Power. Does Not Include A Floor Console. All Exposed Floor Area Will Remain Untrimmed. Standard Vinyl Rear Seat With Trim Matching Front Seats Will Be Provided On Crew Cab Models. Additional Equipment: Seats, Driver And Passenger Front Individual Seats In Cloth Trim / Driver And Passenger Front Individual Seats In Base Cloth Trim. Derived From A Rpo (ae7) 40-20-40 Split Bench Seat With The 20% Section Removed. Seats Are Manual, Not Power. Does Not Include A Floor Console. All Exposed Floor Area Will Remain Untrimmed. Standard Cloth Rear Seat With Trim Matching Front Seats Will Be Provided On Crew Cab Models. Additional Equipment: Paints, Solid, Woodland Green / All Normally Body Colored Non-sheet Metal Parts Will Be Flat Black. Bumper Top Cap Will Be Gloss Black. Door Handles And Mirrors Will Be Grain Black. Deletes Standard/packaged Bodyside Moldings. Additional Equipment: Paints, Solid, Wheatland Yellow / All Normally Body Colored Non-sheet Metal Parts Will Be Flat Black. Bumper Top Cap Will Be Gloss Black. Door Handles And Mirrors Will Be Grain Black. Deletes Standard/packaged Bodyside Moldings. Additional Equipment: Paints, Solid, Tangier Orange / All Normally Body Colored Non-sheet Metal Parts Will Be Flat Black. Bumper Top Cap Will Be Gloss Black. Door Handles And Mirrors Will Be Grain Black. Deletes Standard/packaged Bodyside Moldings.